Wednesday was a wonderful evening. I received an invitation several months ago to give a talk about my hand dying techniques with silk. As these things often go, a spark of an idea came about from the mother of a woman i worked with at the hospital who loved my silk, and has been a wonderful customer of our soap. She spoke with her mom, who in turn shared our business with a coworker who happens to be on the Brunswick Art Works committee. And there you have it. Barbara, the organizer of this event, invited me to bring any and all of the items I make. She asked that the focus be on the silk dying, but offer the other things as a sideline. I started my talk explaining how art has always been a passion of my life, and at one time i thought i would go to art school and do art the rest of my life as a living…. I told the story of how loosing job and income makes the creative energies surge, and how I discovered silk painting some 7 years ago by accident. I had to show them my first silk scarf… done in the serti method, or colorbook outline method if that is easier to grasp. And i showed them every flaw… the places where the dye bled through the resist, the places where the color pooled oddly, or was lighter, or the smudges of odd color… and how my perfectionist desire made this process next to impossible for me. Yes, the background is bright orange, and there are green leaves and deep crimson-magenta egyptian stylized flowers. It was my doodle stage… and i loved to doodle such flowers. 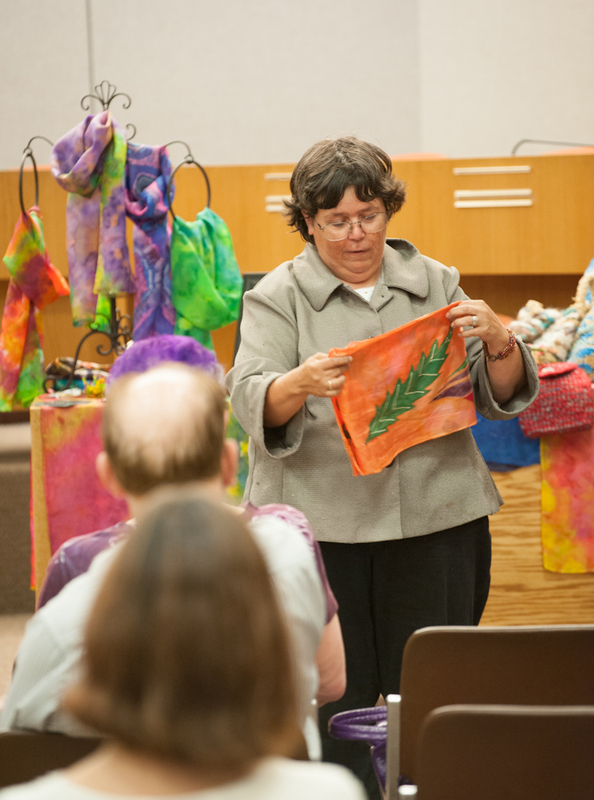 I moved on to share how I discovered shibori, and how I found a harmony and peace with myself and that perfectionist within when i learned how to bind and dye silk. And i brought 3 examples of how silk is wrapped in preparation for dying. I took the liberty to dye them the night before, and the only thing left was to open them up. The crowd intensely watched my hands as i removed the binding of the first scarf… and then unfurled it. They were amazed at the deep yellow centers and red to purple flower forms on a field of greens which emerged… and it was a new discovery of something amazing. The crowd was eager to see more, so i continued to show the next scarf, and unfold it… this time it was the traditional pattern known as the storm – a field of blues, with ripples at an angle… intended to look like waves of the angry ocean in a storm… each time i dye this patter it looks a bit different… this time there was a bit more white space left, but the crowd awed and oooed. and the woman with the unique hair style in the front row turned out to be a reporter from the Sun News. She planned to do a story on me, and took copious notes. It was a wonderful connection, and a great opportunity to get to know more of the artist community of northeastern ohio. It was a delight to share my passion, and more than that, to share the simple joy of utilizing the creativity within. Thank you Brunswick Art Works, and thank you Erin and Val for that connection. It was a real blessing. We are in negotiation of a 2 part class on silk dying… i think it will be a lot of fun… and stay tuned… i will certainly post updates as we get things finalized.